Here at HIP Video Promo, we’ve had the profound pleasure of helping break a number of extraordinary debut albums for the likes of like Paramore, Maroon 5 and 30 Seconds To Mars. Upon listening to Melbourne, Australia’s jacobs run, it is apparent that the band is prepping for success. With just three singles, this power-trio have found the yellow brick road where originality and accessibility meet, keeping us hooked on a debut record that wields the type of poise and personality that is normally reserved for alt-rock icons. The music video for “Sleepwalking” is a cinematic journey that sets the bar for things to come. jacobs run is made up of Melbourne scene veterans, Michael Jacobs, Fabian Bucci, and Peter Curigliano. 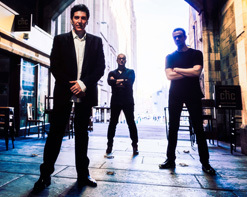 Having played in bands together while navigating the scene down under has led the group to crafting a self-assured polished sound that flaunts their mastery in songwriting and orchestration. And yes- I mean orchestration in a literal sense- classical strings swell in and around the distorted guitars and clamoring drums, steering them away from being your average rock band. The band, in their own words, sets out to create music for people who believe in the power of a rock n roll band to be uplifting, intelligent, and mean something substantial. “Sleepwalking” is the perfect showing of jacobs run’s message as a band. The video opens up with breathtaking underwater images as frontman, Jacobs tells the story of a man stuck in his head, overthinking conversations with a lost lover. The entrancing video, shot by Scott Kingman, alternates between trippy images of a deep cerebral dream and Jacobs’ daily struggle of ruminating on his thoughts. The foot-stomping beat and catchy melodies led by the band’s classical influence keep the listener wanting to spin this track on repeat and the colorful video serves as the perfect visual aid for the experience. We are absolutely ecstatic to be teaming up with the new Australian alt-rock phenomenon known as jacobs run to bring you the “Sleepwalking” music video and to see it included in your regular programming and featured on your website or blog would truly make our day. Don’t hesitate to let us know what we can do on our end to make that happen. Please contact Andy Gesner and the HIP Video Promo team at (732)-613-1779, email us at info@HIPVideoPromo.com or visit www.JacobsRun.com.au for more info on jacobs run.